Maryland rock stalwarts Clutch are one of the hardest working rock and roll bands in America. Since forming in 1991, the group has toured the world relentlessly with everyone from Finnish melodic death metal outfit Children of Bodom to notorious shock rocker Marilyn Manson to thrash legends Slayer. In a recent interview with The Marquee, vocalist and rhythm guitarist Neil Fallon reflected on a lifetime of pure rock fury. In an age of streaming playlists and dwindling record sales, Fallon attributed the band’s longevity to their ardent refusal of narrow-minded musical classifications. “I think people really over-specify rock and roll. I think metal is particularly guilty of being, you know, very conservative and orthodox regarding what is and is not ‘real’ metal,” he explained. “ You can get into [arguments like]‘Is this death metal or is this black metal?’ It makes absolutely no difference to me. Back when we toured with [Marilyn] Manson, every night I walked off stage thinking that tour was the biggest mistake we had ever made. But the next time we rolled through those towns, a bunch of those people came back to see us because we got out of our comfort zone. Life’s too short to be afraid. People told us the  Slayer tour was going to be too brutal. ‘You’re gonna get destroyed by their crowd,’ they said. Nothing could’ve been further from the truth. Fallon’s insight, much like the band’s success, certainly didn’t happen overnight. After more than a quarter century of life on the road, the band has remained committed to the spirit of rock and roll. Fun, as Fallon emphasized, lies at the heart of this music. On their recently released twelfth studio album, Book of Bad Decisions, Clutch has tapped into a diverse array of influences to produce one of their most varied records to date. Fuzzed-out, swampy guitar lines propel the anthemic “Gimme the Keys” and “Spirit of ’76.” “In Walks Barbarella” features a horn-fueled chorus that drips with (weaponized) funk and swagger, while “Vision Quest” kicks off with a rollicking piano lead that harkens back to Jerry Lee Lewis. Across the album’s staggering 15 tracks, Neil Fallon’s soulful sermons and stream-of-conscious reflections take the listener from old school punk shows to contemporary political disillusionment. While some bands struggle to retain their initial creative drive past their second or third album, Clutch has only grown stronger and more inspired with age, all the while avoiding burn out or retreading the same ground throughout their lengthy career. 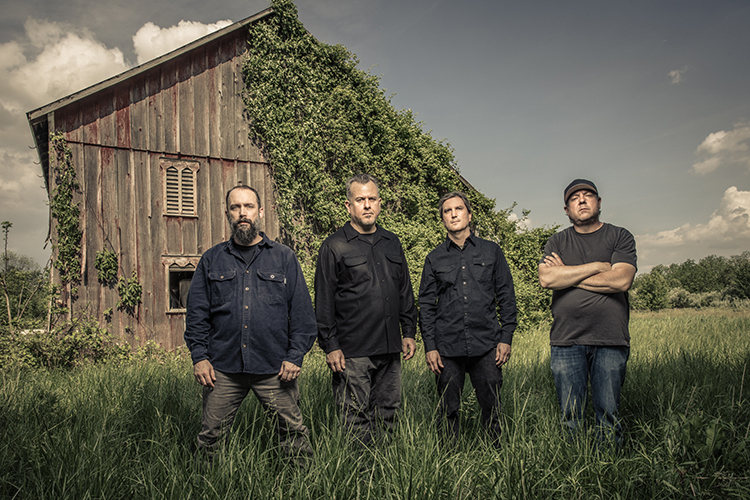 Clutch – which is Fallon, guitarist Tim Suit, bassist Dan Maines, and drummer Jean-Paul Gaster – remain as dedicated to rock and roll as ever, and for them, that means a decidedly apolitical approach to art. Given the crisis fatigue experienced by so many at this moment in America, Fallon’s call for art-for-art’s-sake is admirable. However, he admitted that current state of political affairs has made its way into his creative process in ways he had not foreseen. And given the band’s proximity to Washington D.C., one might assume that politics would work its way into Clutch’s writing process. Fallon explained that he continues to resist that impulse, though he’s not always successful. “I don’t want to pollute the music with personal politics because that’s a very slippery slope, but at the same time this is the world we live in. I’m just as susceptible to those influences as anyone else. The “bright side” includes the aforementioned wisdom accumulated from a lifetime of vans, “crappy RVs,” questions about when and where the next meal will come from – in short, the life of a touring musician. For Fallon, those experiences as a musician inform how he approaches fatherhood.